So you need to get from Shenzhen to Hong Kong Airport (HKG) and the options aren’t clear. We compiled a list of options with approximate costs/travel time/level of convenience. This is a preferred method of many because of its speed (about 30 minutes from Shekou) and convenience (some airlines even allow you to check in your luggage before boarding). However, it can get quite expensive if there’s more than a couple of you. The adult tickets start at 274RMB and child (1-5 y.o.) tickets start at 177RMB. If you are planning to use the ferry on your return trip as well, booking a roundtrip ticket will save you money. However, it’s only valid for 3 months. When you exit the ferry in Hong Kong, there will be a booth that says “Tax Returns.” You can go there with your ferry ticket and get some of your money back. Keep in mind that the ferry doesn’t run 24/7. With its first departure being at 7.15am and the last one at 9pm, there are lots of flights it doesn’t accommodate. 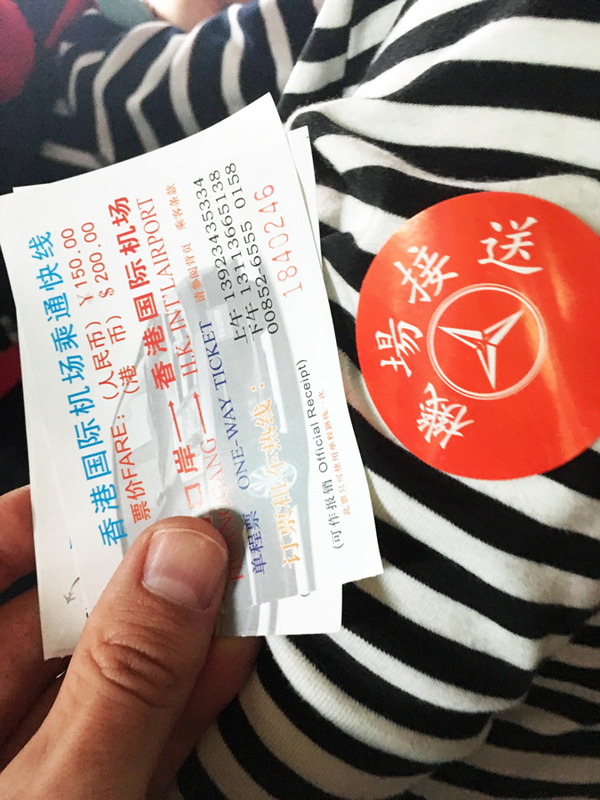 SkyBus operates out of Huanggang checkpoint. You buy a ticket before crossing the border, get a sticker on your shirt, and as soon as you emerge on the other side, there are people waiting for you to take you to the van. You don’t need to get out to cross into Hong Kong. The drive is only about 20 minutes. The cost is 150RMB per adult. The cost of the child ticket is somewhat negotiable 🙂 This border crossing is open 24/7 which is very convenient for those early morning or late evening flights. Huanggang border bus is the option we personally like best. You get a ticket AND a sticker! If you have no luggage, MTR may work for you. You cross the border at Futian checkpoint, hop on the MTR (Lok Ma Chau station) and go all the way to the airport. The trip will take about 90 minutes (from Lok Ma Chau) and requires 4 interchanges. The cost will be around 120HKD per adult (half of that for the child). Alternatively, you can take MTR to Sheung Shui station and take A43 bus from there (this trip would be a little shorter – maybe 70 minutes). There are vans/cars for hire that can pick one up anywhere in Shenzhen and deliver straight to the airport in Hong Kong. Sometimes you don’t even need to get out of the car for the border crossing! This is very convenient but the cost is rather steep: about 700RMB per vehicle. Still, this is a brilliant way to do it if you have a lot of luggage and/or have friends interested in carpooling. Like Huanggang checkpoint, Shenzhen Bay also has buses going to the airport. The ticket costs 150RMB and needs to be purchased before you cross the border. However, since this border doesn’t stay open around the clock, the timing will not work for everyone. Also, this is a rather popular checkpoint and it can get very crowded. 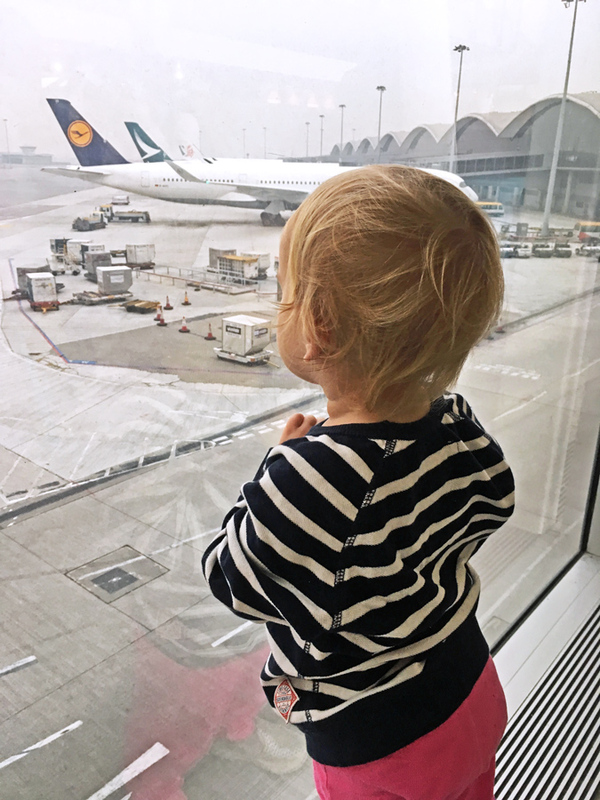 Whichever option you choose, we hope you get to HKG with enough time to grab a coffee and watch the planes. How Would You Choose to Get to Hong Kong Airport from Shenzhen? Have you tried any of these ways of getting from Shenzhen to Hong Kong Airport? Which one is your favorite and why? P.S. If you are looking for some free and cheap things to do in Hong Kong, check out this post. For more about living in Shenzhen, check our our Life in China Series. A lot of good options here. I had no idea it was so complicated, so this is very helpful to keep in mind. The ferry option sounds good to me. Thanks for this informative post. I guess the ferry ride is awesome! Did you take the ferry? What’s the SkyBus? Is it a sort of monorail? We’ve taken the ferry but not to the airport 🙂 Our flights never arrive or leave at the right time to do it. We’ve heard that it’s particularly nice view in the evening. The SkyBus is just a van, really. A monorail would be so much more exciting!! We love going to Hong Kong and often use it as a base when traveling around Asia. One of the things we were looking to do was take some trips to explore the surrounding areas – and obvs China is a great option. Haven’t heard of Shenzhen before but it seems pretty straight forward to travel between – so perhaps this is a nice option. Popular things to do there? Shenzhen is right across the border! It’s fairly easy to get to and many nationalities that normally need a visa to visit China can get a 5-day “shopping visa” right at the border. As for popular things… there is some hiking, some dirt cheap Chinese food, some temples and Hakka villages, a nice botanical garden a bit outside of the city. This is great post for the first timers. Cruise option looks interesting as personally i like cruise travelling. Great post and keep up the good work. These kind of posts are so helpful. Getting to and from airports can be the most stressful part of a trip. I always try to find a compromise between the cheapest and the easiest way of travelling to airports. Thank you, Mel! Our first time trying to figure this out was a bit of a pain so we wanted to help others navigate with ease! Unfortunately not, and I would love to visit Hong Kong one day! Arriving to the town by ferry sounds like my kind of transportation. 🙂 I love taking the ferry to my summer getaway, the island of Cres, Croatia- 20 minutes from the mainland and you’re on the most beautiful, peaceful island. That sounds lovely! We haven’t seen Croatia’s coast, only Zagreb and Plitvice Lakes. Time for another trip, I guess! This is very useful. And from what you’ve said, the Skybus seems the best option to me, too. 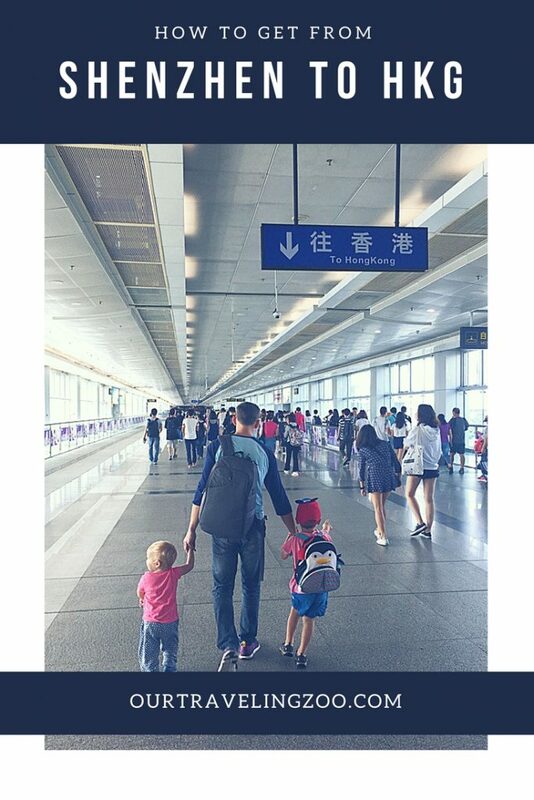 you can get the metro from lo wu / luoho too doesnt necessarily have to be Futian as you stated in your post. Ferry can also be gotten from Fuyong to HKIA not jsut from shekou as you stated in your blog. and Skylimo car can also be gotten from SZBAY border not just buses. Please do your research more throughly. Thank you for taking your time to comment! We add new information to this post as we come across it.